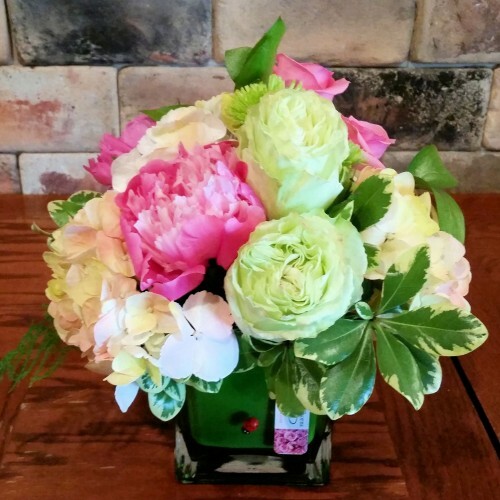 Invite your special someone to reminisce of lovely English gardens when you present them this gorgeous fresh flower bouquet! 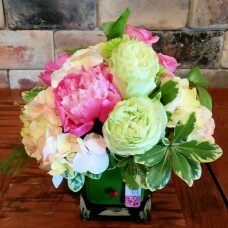 WIth prominent peonies and fragrant hydrangea framed by pretty greenery, your special someone is sure to fall in love with these flowers. The low compact cube vase will fit any work or home space while the flowers brighten the day of whoever gazes at them! Invest in the best to make this arrangement even more special in both value and fullness of flowers! Good: as seen in photo, Better: add value in flowers, Best: add even more value in flowers.